I offer myself entirely to thee. keep me, guard me as thy property and possession. Feast day is August 22. Coronation is one form of reverence frequently shown to images of the Blessed Virgin Mary. It is especially from the end of the 16th century that in the West the practice became widespread for the faithful, both religious and laity, to crown images of the Blessed Virgin. The popes not only endorsed this devout custom but "on many occasions, either personally or through bishop-delegates, carried out the coronation of Marian images." In the 17th century a special rite was composed for the coronation of religious images of Jesus, Mary and the saints. In the 19th century a rite was written for crowning images of Mary. New rites were approved by the Congregation for the Sacraments and Divine Worship in Rome of 25 March 1981. The English translation was approved by the Administrative Committee of the National Conference of Catholic Bishops of the United States on 24 March 1987 and confirmed ad interim by the Apostolic see by decree of the Congregation for Divine Worship on 22 May 1987. The new Order of Crowning includes three types of coronation. Why put a crown on Mary's head? She is the Mother of the Son of God, who is the messianic King. Mary is the Mother of Christ, the Word incarnate. "He will be great and will be called the Son of the Most High; and the Lord God will give him the throne of his father David; and he will reign over the house of Jacob for ever; and of his kingdom there will be no end" (Luke 1:32-33). Elizabeth greeted the Blessed Virgin, pregnant with Jesus, as "the Mother of my Lord" (Luke 1:41-43). She is the perfect follower of Christ. The maid of Nazareth consented to God's plan; she journeyed on the pilgrimage of faith; she listened to God's word and kept it in her heart; she remained steadfastly in close union with her Son, all the way to the foot of the cross; she persevered in prayer with the Church. Thus in an eminent way she won the "crown of righteousness," the "crown of life," the "crown of glory" that is promised to those who follow Christ. In the United States, a custom developed that grew in popularity prior to the Vatican II council. In parishes, at marian shrines, and at grottos, someone was chosen to place a wreath of flowers on Mary's image. This ceremony usually took place in May and often in the context of a Benediction, a special Rosary celebration, and sometimes at the closing of Mass. The practice continues in many parishes throughout the United States. Many parishes have found innovative ways to express their reverence for the dignity of Mary, the Mother of God and of our Lord Jesus Christ. The Order of Crowning, however, as mentioned here, is an official, liturgical act fittingly carried out by the diocesan bishop or delegate. It may take place at any time of the year, fittingly on solemnities and feasts of the Blessed Virgin Mary or on other festive days. 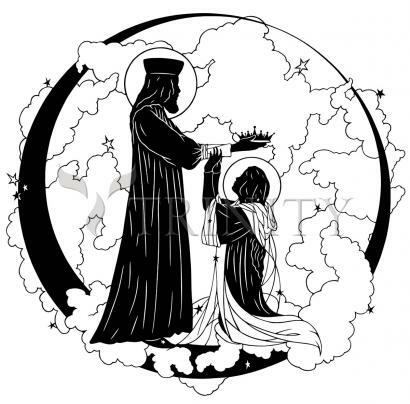 As the Order of Crowning states, "....it should be noted that it is proper to crown only those images to which the faithful come with a confidence in the Mother of the Lord so strong that the images are of great renown and their sites centers of genuine liturgical cultus and of religious vitality. For a sufficient period before the celebration of the rite, the faithful should be instructed on its meaning and purely religious nature... The crown should be fashioned out of material of a kind that will symbolize the singular dignity of the Blessed Virgin." The instructions ask that the crown nevertheless be simple and avoid "opulence." Mary's prayers for us and our intentions are requested. We rejoice with her that one day we may share her dignity when we ourselves may receive the "crown of glory."